I’ve been watching a lot of plays from time to time. And I’ve been curious on what is a Cantata. In celebration of DLSU Centennial Celebration, a musical production about the history of Lasallian mission in Asia. 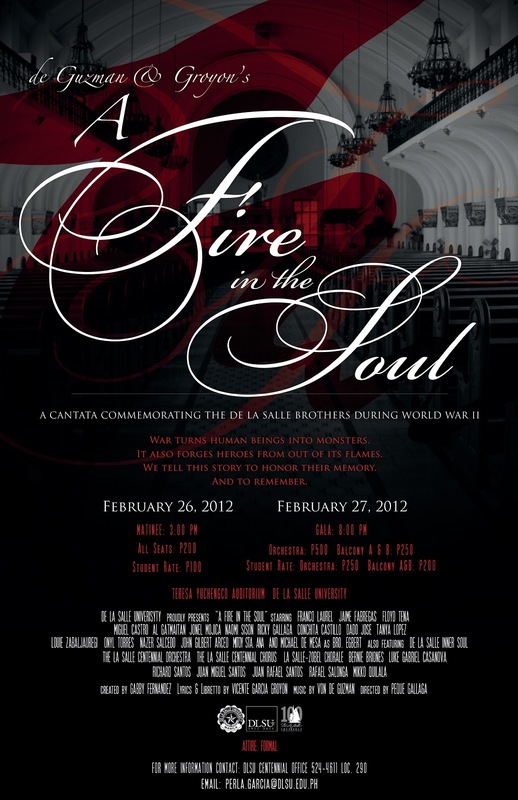 A Fire in the Soul: A Cantata tells about the story of a crucial event in the history of the Lasallian mission in Southeast Asia. On February 12, 1945, as the American forces bombarded the City of Manila, a group of Japanese soldiers entered the De La Salle College campus grounds on Taft Avenue. They attacked the people who were living there. Twenty-four men, women, and children, and 16 La Salle brothers died in the massacre. War turns human beings into monsters. It also forges heroes out of its flames. It’s about the story to honor their memory, their service to humanity, and to remember them eternally. It was created by Gabby Fernandez and directed by multi awarded director Peque Gallaga, the Cantata is one of the highlights of the year long centennial celebration of De La Salle University(DLSU) in the Philippines.Vicente Garcia Groyon wrote the libretto and Von de Guzman composed the music. A Fire in the Soul: A Cantata will have two performances only: February 26 (Sunday – Matinee) at 3pm and February 27 (Monday – Gala Night) at 8pm. Both shows will be heldat Teresa Yuchengco Auditorium at the 7th Floor of Don Enrique T. Yuchengco Hall of DLSU. The cast includes Michael de Mesa (Br. Egbert), Franco Laurel(Br. Antonius), Al Gatmaitan (Br.Mutwald), Jonel Mojica (Br.Friedbert), Miguel Castro (Br.Arkadius), Floyd Tena (Br.Athanasius), and Naomi Sison (AlmaMater). Joining the Production and the Artistic Team are Mio Infante (Production Design), Dong Calingacion (Technical andLighting Director), GA Fallarme(Projection Design), Br. Bernard S. Oca,FSC (Executive Producer), and Lore Reyes (Line Producer). For the matinee performance on February 26, 2012 (3pm), regular tickets are at P200, while student rates are at P100. And for the gala show on February 27, 2012 (8pm), orchestra seats are priced at P500 (regular)/ P250 (students)and balcony seats at P250 (regular)/ P200 (students).